Group 3: poems returned, with corrections and provisional grades. 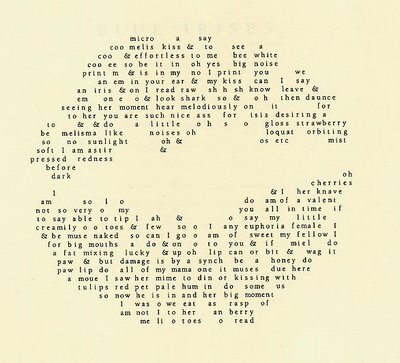 In Michele Leggott’s ‘Micromelismata,’ a set of words is used to draw the outline of a pair of lips. In 'Oes & Spangs,' she's provided us with a poem which can be looked at statically on the page or kinetically on-screen. Draw a picture of something from your own room at home. Now copy the shape of your drawing as a collection of words or short phrases. Decide what you want your poem to be about. What kinds of words are you going to use? Will they form sentences, or stand on their own?